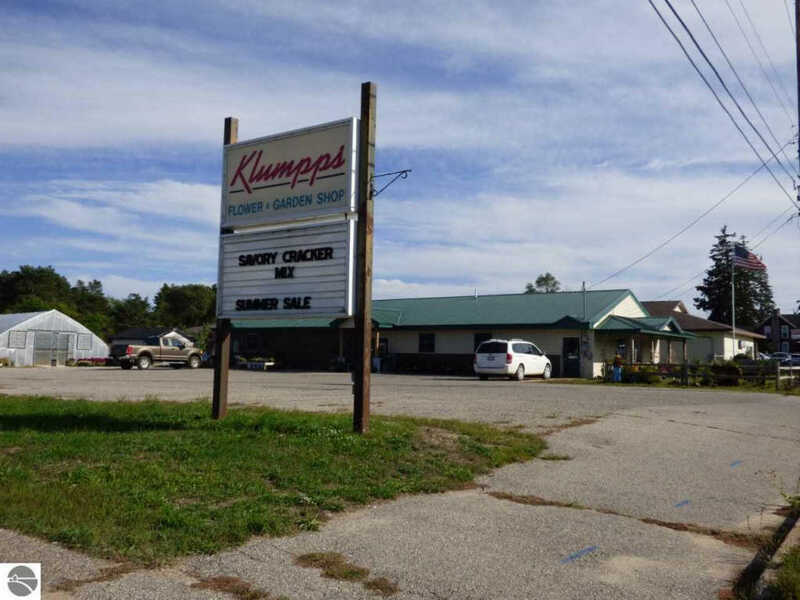 Klumpps Flower & Garden Shop is one of Kalkaska's longest running businesses at over 50 years, and it can now be yours. On the most travelled stretch of US-131 in Kalkaska, with over 13,500 Annual Average Daily Traffic, according to MDOT, this is a prime commercial location for a multitude of businesses. The 3.19 acre parcel, among the largest in the village, has frontage on two roads. It has 137' frontage on N. Cedar Street, US-131, as well as 285' frontage on E. Kalkaska Street. Continue as a flower shop and nursery, or utilize this large commercial property for a new venture. The main retail building offers over 4000 square feet of space, with abundant retail display space, an office, bathroom, storage, floral cooler, and work room with double sink, storage cabinets and vinyl flooring. The property also has a 30' X 90' functioning greenhouse, with gas furnace, electricity, water and drip sprinkler system. Four other structures provide shelter for supplies or equipment. There is ample paved parking for retail customers, and the gravel drive continues through the property so that vehicles can exit on E. Kalkaska Street. This is a tremendous opportunity. Review the zoning ordinance, under Associated Documents, for the expansive commercial uses.